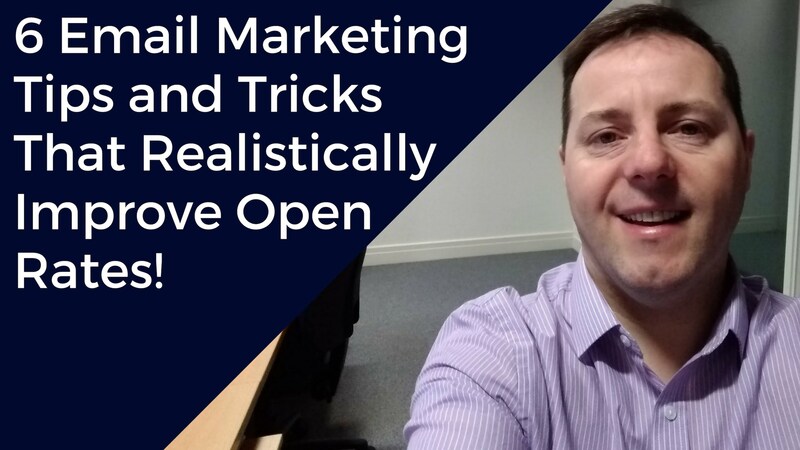 6 Email Marketing Tips and Tricks That Realistically Improve Open Rates! In a world where many people listen to Spotify instead of radio, spend insane amounts of time watching YouTube and fast forward catch up TV when adverts come on. It’s becoming harder to get your message across and help others. In a world with more noise each day here’s my 6 email marketing tips and tricks to get higher open rates. I don’t want to waste people’s time so weak after week with people not opening my emails I decided to remove them from my list trouble is I needed to work out the balance between the person not being interested in an particular email I send once a week or the person not being interested in anything I offer and only signed up because they wanted my free download. Some people recommended 6 months and some people recommended a year and have no email opens then get them off your list. I found an interesting article by an expert called Neil Patel who recommends if an email does not get opened 5 times in a row. So, you’re sending out weekly emails that would be 5 weeks and no opens! Get them off your list. At the end of the day your list is prime property and your paying for it. You don’t want non-interested people on your list and by cleaning up your list you improve the quality of your list by only keeping interested parties on it. I got caught out big time with this one. Here’s what happened. I ran a campaign and people subscribed to my list in return for a free PDF download, and those people who signed up for my free eBook download didn’t get my eBook. After a bunch of emails I tested what was going on. It turned out that the email with the download was being email to spam folders. The reason being was, I had a couple of words the spam filters didn’t like. How I fixed this was. I Googled a newsletter spam tester and many pages were listed, the top link was free to use, it gives you a unique generated email address each time you use it to send your email to be analysed. Once my email was scanned in seconds, I found out a couple of words that are classed as marketing or sales. Once I changed them for other words, my emails worked fine. Based on my experience with spam scores I would highly recommend you spam check all emails before putting them into your autoresponder. I have talked about the importance of subject lines before in emails and is its so powerful I’m going to talk about it again in this blog. One of the best ways to find an email subject line is to do a search on Google or on YouTube for a key phrase that closely matches what you’re trying to achieve. The benefits of this is, Google and YouTube use AI to cross reference millions of pages and videos then bring back the 10 best, most viewed pages/videos using an array of algorithms. For me, I find this is the best way to get a headline with all the necessary key words to be competitive is, just tweak one of Google top ten listings so that it reads well and formatted in a way that’s of interest to your audience. When you write an email think about the styles you write in. This could be “Problem”, “solution”, “outcome”. You may use a character and that character could be something like increasing pricing or technical difficulty, just make the character into something that’s a real issue with people who could benefit from your product or service. Then go on to talk about the benefits and finish off with two benefits out of six, with a message, to read the other 4 benefits click here. Then you look at your stats after driving 100 or so people to that email and you see how many people took action. If it’s a good conversion rate you stick to that style of writing because over the weeks, people start to get used to your style and how you write so keep it consistent. Once people get used to your style of writing, they get to like your personality and look forward to your email tips. So, you have to be thinking consistency consistency consistency and especially so with email. When you send emails, send them in plain text no I don’t mean to take the text format I mean use HTML because of tracking is done with the HTML and special URL links are used. Just don’t have lots of images in there. This is important and means that mobile phones are being used very heavily, so you want to make sure that the emails you send out are format nicely on a mobile phone. Here’s how I do it. Use a size 14 font so it is big enough for the visitor to read, especially when she is over 35 as there is a higher chance people’s eyesight start to go at close contact like looking at a mobile phone or looking at a book closely will need glasses, whereas a size 14 font will make an email easy to read on a mobile without glasses. Which is great, especially if your reader is commuting and don’t want to pull out their glasses. So you want to be keeping images to a minimum and don’t use all different coloured backgrounds keep it basic. White background with dark text. Previously I talked about if someone doesn’t open up 5 emails in a row. So if your sending one email a week, that means your email reader has not read one of your emails in five weeks. It’s time to get them off your list, after all your list is prime space which you pay for. The issue is that your email reader may not be at a level yet to purchase your product or service. So another thing I like to do is when I take somebody off a list is to put them into a spreadsheet and upload that spreadsheet once a week as a YouTube Custom Audience. You need about 500 email addresses, so just keep adding non-responders and try different ads with different messages aiming at different levels of expertise that you offer. This may show you as new ads get clicked that your non-responsive email addresses could be looking for more or less advanced content from you. At the end of the day, non-responsive people on your list registered for your free eBook, so they were interested at some level of expertise you offered. One thing I like to do is take a Facebook ad to a survey page landing page. How this works is. You have 4 or 5 selection boxes asking the visitor to click their level of experience, this is where you match each experience level to a different eBook. Once the visitor selects their level of experience using a Google survey, you redirect them to a download page asking them where to email the PDF they selected. This way you get to see what the unresponsive people are more interested in, which helps you focus your products or services. And a plus is you get unsubscribes to engage again with your list.